Hello! Welcome to the Taylored Expressions November Stamp of the Month Blog Hop! Today I used both the November Stamp of the Month (In the Garden) and the November Key Ingredients (featuring patterned paper from the Fancy Pants Happy Go Lucky collection). 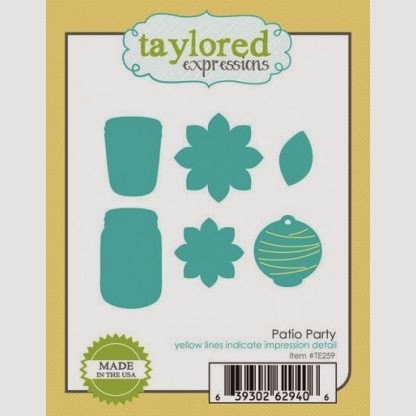 Accessories: Taylored Dies: Patio Party, Pockets & Pages Essentials - 3x4, Pockets & Pages Essentials - 4x4 (TE); Ribbon from Key Ingredients, Wooden button (Maya Road), Hemp cord, Enamel Dew Drop stickers (Freckled Fawn), Foam tape, Thread, Sewing machine. A really lovely card Stephanie. I do like the papers and colours. 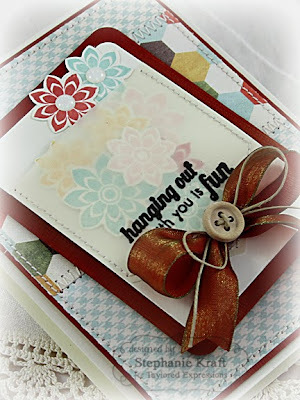 Love the flowers in the vellum pocket, fun sentiment too! What a clever idea to make the vellum pocket for the diecut flowers, Stephanie...sooo fun!!! 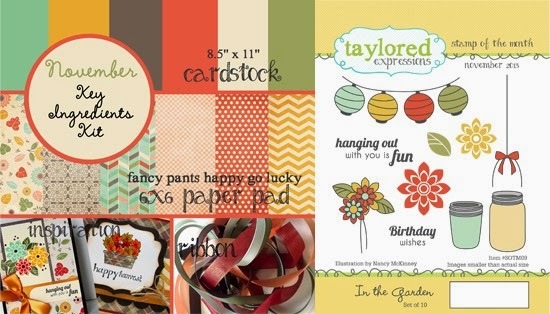 Love how you used the P&P dies, too!!!!! Such a pretty card Stephanie! Love all the pretty blossoms and beautiful bow! What a sweet card Stephanie. Love the vellum pocket and the beautiful flowers. The stitching looks great! Stephanie, this is so so soft and pretty! Love your stitched vellum pocket and absolutely love how you tied in the darker colors with the gorgeous ribbon! Sweet! I love the velum pocket.